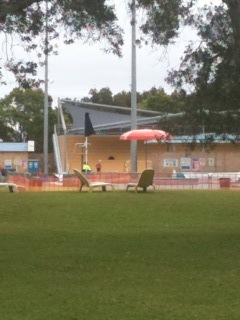 Botany Aquatic Centre has gotten lost in the 1950's and we are all the better for it. 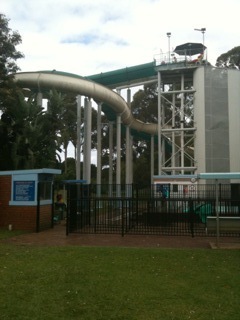 Botany Aquatic is only open during the summer months because all of its attractions are outdoors. There are sun lounges and cute old fashioned sunshades, there are BBQs, a children's playground and even a little handball wall. A major attraction for children over 130cm are the big flumes which you can ride every half an hour - great exercise on the way up and loads of fun sitting on a mat on the way down! For those of us who can't spend more than an hour or two without a coffee there is a kiosk which serves the important cappuccinos and lattes, as well as hot snacks and icecream. Climb to the top - so good for your heart! 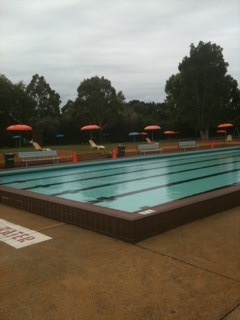 But mostly what there is at Botany Aquatic is loads of space. There is an endless grassy lawn, where children running around shrieking, playing tips and generally doing what children do, is actively encouraged. An afternoon spent at Botany Aquatic has an innocent wholesomeness about it that reminds you of a youth spent time hanging out with friends in the long hot summers, swimming, topping up your tan and eating hot chips with wrinkled fingers from too much time in the pool. Well, we might all have moved on from natural tans to spray-ons but all the other pleasures remain the same. Maili.Eesti Vabariik, Aseris oli ka õues bassein, kui ma olin laps.